Shalir is one of the few geldings of the lot. That's quite natural since I've mainly visited studfarms. You don't have much use for geldings in those places... Shalir was a wonderful little horse to work with, always trying to please. I met him at Slängsboda when I did my mandatory work experience when I was 15. 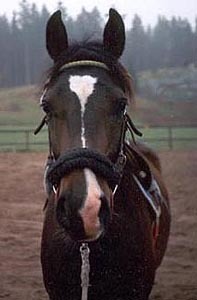 His sire Poem was later gelded and is one of the best endurance horses in Sweden. His dam Shimmy was bred by the actor Jarl Kulle and bought by Slängsboda when he dispersed his horses. She was a very beautiful mare and also dam of Sahibb who has competed in western, and two mares, Shimra and *Shimita.